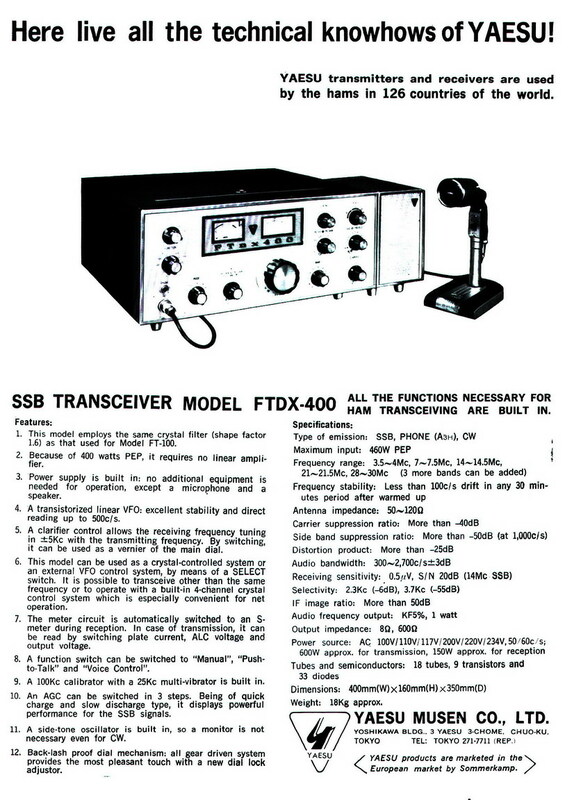 In April 1968 Bail Electronic Services introduced the Yaesu Musen Co. FTdx400 HF Transceiver to the Australian amateur radio market. A predominantly all valve transceiver, it offered a high 500 watts PEP transmit power input and had the same square lines of the earlier marketed FTdx100. It's introduction to Australia came in the form of a full page advertisement in the April 1968 edition of the Wireless Institute of Australia's Amateur Radio magazine, as shown below. As can be seen from the block diagram below, the FTdx400 used mainly valves with 2 x 6KD6's in its final transmit Power Amplifier. The only areas where transistors were used was in the VFO and Fixed Crystal Oscillator. The FTdx400 boasted 18 valves, 9 transistors and 35 diodes. It's dimensions were relatively large at 400 mm wide x 160 mm high x 350 mm deep and weight was 18 Kg. Below is Yaesu Musen's first FTdx400 brochure. You'll note that it advertises a PEP input power of 400 watts, however Bail's advertisement states 500 watts! Shown above is a Yaesu Musen Co. advertisement for their then new FTdx400 HF SSB Transceiver. The advertisement appeared in the September 1967 issue of an English language Japanese magazine, "Electronic Products of Japan". Fred Bail passed away in the late 1970's, Jim Bail passed away in the early 1980's. 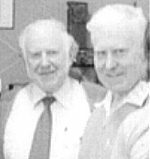 Following Fred's passing their company was sold to Stan Roberts of Teletramel, who continued to run Bail Electronic Services into the early 1990's from the Victorian country town of Wangaratta. The author would be happy to hear from anybody who has very early Yaesu equipment, such as FL-20 Mark's 1 and 2, or FL-100B Mark's 1 and 2. By way of some background information on the author, Greg Whiter was employed by Bail Electronic Services (see 1974 staff photo) from the late 1960's through to 1977. Following this period he formed the company GFS Electronic Imports, GFS Electronics and then Portable Masts Australia Pty Ltd, of which he is a director today.